Big Island Rachel's Books: Inaugural Post of Big Island Rachel's Books! Inaugural Post of Big Island Rachel's Books! Don't worry, the thinly veiled spells intended to bring about the end times--I mean, the delicate musings of Big Island Rachel's regular blog will continue. I just want to write about my books, because I love them so. More importantly, I don't want to subject my regular readers to any more posts about comic books. I sense that I lose a significant percentage of my already-small audience every time I post this picture. So BigIslandRachel will continue reporting the actual events of my weird and wonderful life, and BigIslandRachelsBooks will be about books (and comics!) I'm reading. They'll link to each other often. You'll enjoy it. 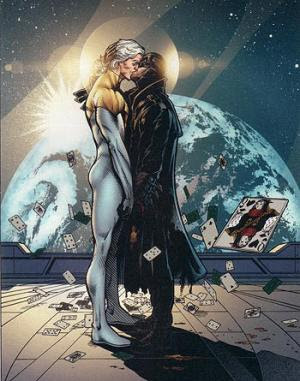 Remembering Wildstorm: Stormwatch, "Jenny Sparks"